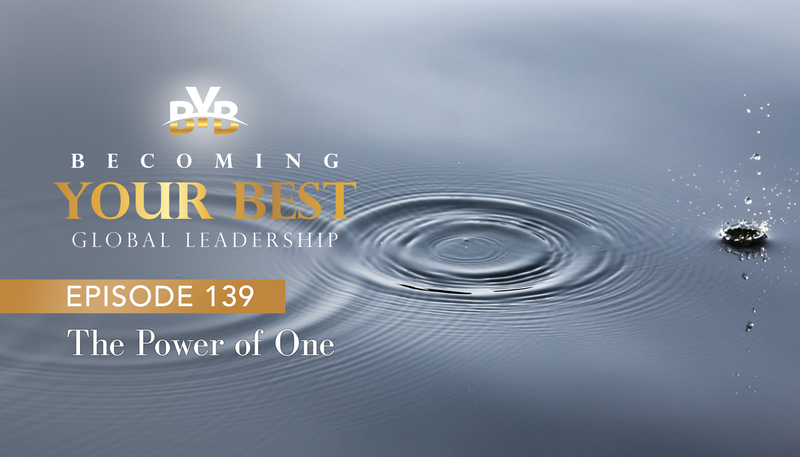 Hello, this is Steve Shallenberger with Becoming Your Best Leadership podcast. Welcome, wherever you might be in the world today. I’d like to start out with a quote that introduces the topic that we will be visiting about today. Here it goes, it’s by Edward Everett Hale. “I am only one but I am one. I cannot do everything, but I can do something and I will not let what I cannot do, interfere with what I can do.” Helen Keller said this in a slightly different way. Here it is. “I am only one, but I am still one. I cannot do everything, but still I can do something, and because I cannot do everything, I will not refuse to do the something that I can do.” Those are great quotes. Well in today’s podcast, I’d like to extend an invitation to you to share this particular podcast with someone else. That’s really what we’re talking about today. And the topic is inspired by a trip that we took to Rwanda and just returned last week, which is an East Africa. It was a tremendous reminder of the power that the influence of one good or bad person may have on another person’s life or on a group or a community, a nation or even the world and I might add, lest you think that this influence is restricted to a community, national or organizational leader, I’m talking about every single person that is listening to this podcast today and that’s not listening. I’m talking to you. And regardless of your station, or position in life, you, through your influence, through your leadership can be a force for good in the lives of others within your organization, within your home, your family, or your friends, your community, your nation, and certainly the world. There is no wasted effort when you’re working on doing good regardless of how insignificant it seems. By doing good, encountering evil, the bad, you create a ripple in the water of humanity that can never be stopped. And you will never really know the full influence of that ripple. Your influence which flows from your leadership, which is one of the most powerful defining forces in life is deliberate. And the intent of your influence is captured and your vision, which influences your thoughts, actions, habits, character, and ultimately your destiny, your goals, which influences your specific and focused actions in your personal life, these are your annual goals, which you set over and over and over again throughout life every year, with the focus of doing the things that really count most that year. And then in pre-week planning, which influences what you do this week and today. So these are powerful leadership tools that increase our capacity to make a difference in your life, the life of others, the impact you make within your organization, of lifting and building and creating excellence and also in the world. So as we reflect upon the power of one, together, I will refer to historical examples as well as personal examples where people have touched my life. And remember, your influence will be from wherever your station or place in life is. It makes no difference. Let’s just make a difference, okay? And whether as a parent or a grandparent, a leader, a manager, a coach, a teacher, a friend, a church member, in community service, traveling on a bus or a plane, in the grocery store, on the street, leading an organization or leading a country or whatever place you may be. So let’s start out with George Washington. I’m thinking of three different examples where one person has the power to make a difference. So we call this the power of one. Now, there’s no doubt that I’m not going to refer today to the George Washington that endured eight years of battle, of terrible conditions, of sleeping in the snow with his troops and the many hardships. But they endured those, they worked through those. I’m going to talk about what happened while that took place. In other words, the trust that he was building, the example, and because of that, George Washington was in a unique position in the place that he was serving in at that time where he could make a difference. The power of one. One of those was a story I shared in my last podcast about the reenlistment. The Continental Army had just had the victory at Trenton, but their enlistment was up. And so George Washington invited people to reenlist but nobody crossed the line, not a single person. And it was at that time that George Washington stepped forward and he said, “I invite you to reenlist because you can do today what you will never be able to do again in your whole life. To stand up for freedom. We’ve made this progress so far. This is for your wives. This is for your children. This is for your future posterity that is to come. And so we need you now, you’ll make a difference.” And so, one by one as the call went out to reenlist, they started crossing the line. The vast majority of them reenlisted. Now, this created a huge enthusiasm among other people throughout the colonies to also enlist, and they went on with some very crucial victories. This changes, actually, this is one of the most important points in the war. So that’s one example. One person doing what they could. Another one was, as they had defeated the British in this battle, Revolutionary War, his officers still had not been paid. There was great discontent. And so there was a rebellion of sorts that took place among the top leaders of the military. They decided they would leave the colonial states area, go west and start their own country. And they had set up a special meeting actually to discuss this. George Washington heard about it and asked them to defer their meeting until their regular weekly meeting, which they did. And as they discussed this issue, this idea, he pled with them to consider the impact that this would have and on the future and what it would mean to their freedom, to the freedom of the world and the role that they could play. And then he started the read a letter that he had written to the Continental Congress pleading their case so that the issues that they had could be resolved. He started to read it but he couldn’t see, and so he reached into his pocket and pulled out his glasses. He said, “You’ll forgive me,” as he put on his glasses, “I have lost my sight in the service of my country and it’s not what it used to be.” This very simple act brought many of these leaders to tears. Everything changed that day. They decided not to go through with it, but to support the colonies and to see it through. That was another pivotal moment of one person making a difference. They had another really touchy, tough problem that nobody could seem to solve, with the French and the Indians down in the Louisiana area, which was then the border of the United States. Finally, George Washington decided to go down. He listened. Because of the high trust that he had, they were able to come up with a solution that solved the problem, that created a future that met their needs, and so once again, this was pivotal for the future of the United States. This is an example where one person with their unique abilities, wherever they may stand, can make a difference. Abe Lincoln was another one, very uniquely so. When the crisis came he said, “No, we can’t have two nations. This is one nation that we have. And this was the reason they fought the Civil War. He understood very clearly the dangers of going the other direction. And as a result, we have one nation, the United States of America today. This was because of this man who stood to this principle. How about the Proclamation of the Slavery when it just wasn’t in a place where it could be handled before he took it on. He said, “All people are created equal.” And so, he freed the slaves. This was huge. It’s what he could do. How about Rosa Park sitting on the bus that day when the bus driver came up and asked her to move to the back of the bus? And she ultimately had had enough. She said, “No, I won’t move.” She was arrested. The rest is history as the civil rights movement really took on full power and the indignity of treating people this way was overcome. How about Gandhi. Gandhi, after the independence of India. There were two major factions in India political parties and violence broke out and riots broke out. So what did Gandhi do, who held no official position? He started fasting, and the word went out as he would not end his fast until the violence stopped. It did go on for many days, and he became weaker and weaker and weaker, and he was so weak. And finally, this compelling force of love and concern and a better way to do it, won out and the violence ended and they found that there’s a better way to solve it. These are examples of what that person could do at that time. This is the power of one and once we have the power of one, this becomes a team that’s the power of the one or a nation. How about Mandela as he became the first black president of South Africa. He took office, he was moving into the presidential palace when he got word that the Black Caucus, the political party, who now was the major force there in South Africa was holding a meeting across town and what they were doing is that they had just voted to outlaw the white rugby team. This was the national rugby team. This would have really been a total offense to the white people. So what did Mandela do? He immediately got into his car, and against the advice of his aids, walked into the Black Caucus. It’s a crowded room and it’s packed. And he described that the vision he had for South Africa was a nation for all. It was for all people, and that this would be an offense, this motion that they had just voted upon. He said, so who will stand with me, who will stand with me to make this a nation for all. They retook the vote and it passed to stand with Nelson Mandela by one vote and overturn this decision. This was a huge decision because the rugby team went on to be a unifier for that nation, as they won the world championship. This goes on and on. Helen Keller, Florence Nightingale, Martin Luther King. How about the experience I saw once again last week with President Paul Kagame of Rwanda? Because of his leadership, his compassion for people, the choices he made around good leadership and setting a vision for the future, helped that country heal and get on track to a very prosperous country that’s upbeat and on the pathway to realizing that vision today. These are examples. How about the example of Neal Maxwell. Neal was a member of the Quorum of Twelve Apostles for the LDS Church and in 1997, my wife and I, along with our family, were asked to move to Madrid, Spain to be a Mission President. We had a great experience for three years living there. We had over 500 missionaries we were privileged to work with and supervise. Neal came and he is an amazing man. Compassionate, wise, deeply spiritual. Such insights that he had, it was a privilege to have him there. As we were driving through town from one point to another, he asked about our children. And some of our children were at college in Utah, Utah State University, Brigham Young University. And he asked if he could have their phone number. So we gave it to him, not thinking anything else about that. Neal Maxwell had been suffering for some years with cancer. I mean, we couldn’t believe he was there in the first place. We know he had to be exhausted, especially with the international travel. What we found out later, is he made the long trip back home to Utah. One of the first things he did was made a call to our two sons, first at Utah State, our son Rob and his wife Tonya. He gave them encouragement, sent the love of his parents who were in Spain. And then he called our son David, who was studying engineering at Brigham Young University. When David answered the phone, Elder Maxwell said, “This is Neal Maxwell,” and David said, “Yeah, sure,” and he hung up. He couldn’t believe someone who was so busy, with so much responsibility would take the time to call. He called right back, fortunately. He said, “No, it really is Neal Maxwell and I was just with your parents.” And I will never forget that experience. This is the power of one and we just do it in the ways that we’re able to. Thomas Monson who was on our board earlier in my career sent endless notes and so much encouragement. You don’t have to be a world leader to do these type of things. At the end of this podcast, I’ll issue a couple of ideas for a call to action. One of those calls to action will be to write down all of those that you can think of that have had an influence for good in your life. So I’ve taken this exercise, I hope you don’t mind if I share some of mine. Certainly, not an inclusive list by any means, but Roxanne, my wife, has had a huge influence, our children and grandchildren. I would name them all but they know who they are. I had one of the grandchildren, and I was giving her a ride on my shoulders and all sudden, down on my face, came her hand with the sign language for “I love you.” It’s so delightful to have them run up and give me a hug and squeeze around the neck. These are powerful things, influence that even a child can have, of doing good things. How about my grandparents, uncles and aunts and siblings, school teachers and coaches. Dan and Anne Conger, Stephen and Sandra Covey, Gardner and Dorothy Russell, Lael and Margaret Woodbury, Bill and Elle Jones, David and Wendy Clark, and my work associates who are so amazing. These are individuals that have touched my life. Friends who have just been there. Extended family members, for calls and emails and sending notes and giving encouragement and planning and participating in reunions. Emory from Rwanda who has had a big impact. How about Dave, Bruce, Paul, Kim, Gary, Doug, Julie, Barbara, Jamie, Jerry, John, Carli, Sharon, Rob, Mark, Tom, Murphy, Mick. Wow! It just goes on, and their spouses, their partners and so forth. So one of the largest influences for good in the world’s history is the greatest leader, at least for me, of mankind, and that is Jesus Christ and all that He represents. He lived over 2000 years ago. He walked the roads of Palestine doing good, and yet He was despised by many. He knew what he was about and the power of His influence for good continues to light the world today and continues to expand in our personal lives and throughout the world. What a powerful example of one person that then generates and becomes a power of one and many. So what does your list look like? How can this influence you? So as we wrap up this podcast today, what can you do to make a ripple, to make a difference, to be the power of one in someone else’s life? I’d like to just recommend a couple of ideas. A couple of calls to action. One is to keep working on becoming your best. This is not because someone is watching. It’s because this is your life and it’s the only one that you have. And through the good and the bad, the happy and the sad, be determined to move forward towards your best. And this will bring to you greater happiness, joy, fulfillment, prosperity, longevity and health. And in turn, in the process, you will bless others with your radiance and light as you continue to grow. So that’s one thing. Now here’s another thought, invitation call to action. On a blank sheet, name the individuals that have been a positive influence in your life. Feel the gratitude for the positive influence that they have had in your life, your family and your organization, creating excellence. How can you be better in terms of using that light or influence in simple day-to-day living? Influencing is both deliberate, in other words, when we say deliberate, it’s having your vision, an inspiring and exciting, meaningful vision, goals that are specific for this year and solid pre-week planning that helps you do what matters most. That’s deliberate living, and we program our thoughts that help us. Well also, spontaneous influencing and acts of good, simple acts of good, not trying to impress anyone, but just being good. So these are things that we can do that allow us to expand our influence. Reflecting on the Becoming Your Best: 12 Principles of Highly Successful Leaders is something else you can do. Think about your vision and your goals, especially in perspective of this exercise or activity that I just talked about. What can you do in your station of life to make a difference for good? What can you do to grow that influence? And what are you doing to plant and reinforce the right ideas in your mind, your heart and your DNA that will cause your influence to expand and continue to touch people for good? I know that you’re already making a difference and the power of one is quite significant, and a very spiritual and emotional way of purpose. And each one of us, as we keep working on becoming our best, makes a difference. I’d like to finish this podcast how I began. It is this great quote that I shared with you from both Edward Everett Hale and Helen Keller. Let me just repeat them, “I am only one, but I am one I cannot do everything but I can do something, and I will not let what I cannot do interfere with what I can do.” Thank you, Edward. And here’s Helens, “I am only one, but I am still one. I cannot do everything, but still I can do something and because I cannot do everything, I will not refuse to do the something that I can do. This is Steve Shallenberger with Becoming your Best wishing you a great day.